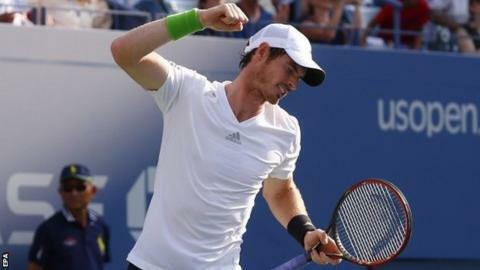 Britain's Andy Murray is relishing the prospect of facing world number one Novak Djokovic in a US Open night session. The pair will meet for the 21st time, with their quarter-final due to start at about 02:00 BST on Thursday. "Playing at night against the number one player in the world is exciting," said 27-year-old Murray. "If you aren't getting motivated or pumped for those matches, then that's when there's a problem." Murray and Djokovic are scheduled second in the New York night session, after the match between Serena Williams and Flavia Pennetta, which begins at 00:00 BST. "That's what you put the work in for, so that when you come to these events and you do have to play against the best players, you're ready," added the Scot, who is seeded eighth. "And as much as it's incredibly tough and challenging - that's what you enjoy." Murray and Djokovic, also 27, know each other well, having competed from the age of 11 in juniors, and they practised together on Arthur Ashe Stadium before the start of the tournament. Djokovic has the edge since they became professionals, having won 12 of their 20 matches and four of the past five, and collected his seventh Grand Slam title at Wimbledon in July. Murray has not won a tournament since he beat Djokovic at the All England Club 14 months ago, but the Scot showed signs in his quarter-final win over Jo-Wilfried Tsonga that he might be getting back to his best. Both he and Djokovic have taken on new coaches this year, the Serb starting work with six-time Grand Slam champion Boris Becker and Murray choosing two-time major winner Amelie Mauresmo to replace Ivan Lendl. "I think he should really go out there and express fully what he's capable of doing," said Mauresmo. "The pressure is probably a little bit more on Novak, which is normal, he won Wimbledon." It is Mauresmo, along with Murray's long-time team member Dani Vallverdu, who will be charged with settling on a game plan. "I would say we play a fairly similar style," said Murray. "I think that's why a lot of the matches have been long games, long rallies, long points, because we do a lot of the same things well. "I don't know exactly what I'm going to do, but by the time I get on the court I'll have a good idea." Djokovic had a poor run of form after Wimbledon, which he has put down to the welcome distraction of getting married and awaiting the birth of his first child in October, but his focus appears restored as he chases another major title. "I do value these tournaments the most and try to always perform my best tennis in them," he said. "I think Andy also performs his best in the Grand Slams. "Even though he had this back surgery last year that kept him off the tour for the last few months of the season, he's been on and off this year. "But I think in the big matches, as the tournament progresses, he's still fit. He still plays very high-quality tennis. That's what I expect him to do."